The previous section described how to find, install, and configure software using “Plugins”. This section describes how to use “Jails”, which allows users who are comfortable using the command line to have more control over software installation and management. Any software installed using “Jails” must be managed from the command line of the jail. If you prefer to use a GUI to manage software, use Plugins instead. While FreeNAS® automatically creates a jail whenever a plugin is installed, it does not let the user install multiple plugins into the same jail. In contrast, using “Jails” allows users to create as many jails as needed and to customize the operating system and installed software within each jail. By default, a FreeBSD jail is created. This provides a very light-weight, operating system-level virtualization. Consider it as another independent instance of FreeBSD running on the same hardware, without all of the overhead usually associated with virtualization. The jail will install the FreeBSD software management utilities so that you can compile FreeBSD ports and install FreeBSD packages from the command line of the jail. A Virtualbox template is also provided. This template will install an instance of phpVirtualBox, which provides a web-based front-end to VirtualBox This can then be used to install any operating system and to use the software management tools provided by that operating system. Before you can create any jails, you must first configure which volume or dataset will be used to hold the jails. To do so, click Jails ‣ Configuration to access the screen shown in Figure 13.1a. It is recommended to create a dataset to use for the “Jail Root”. As jails are created, they will automatically be installed into their own dataset under the specified path. For example, if you configure a “Jail Root” of /mnt/volume1/dataset1 and create a jail named jail1, it will be installed into its own dataset named /mnt/volume1/dataset1/jail1. if you have already installed any Plugins, the “Jail Root”, “IPv4 Network”, “IPv4 Network Start Address”, and “IPv4 Network End Address” will automatically be filled in. You should double-check that the pre-configured IP addressing values are appropriate for your jails and will not conflict with addresses used by other systems on the network. Table 13.1a summarizes the fields in this configuration screen. Refer to the text below the table for more details on how to properly configure the “Jail Root” and network settings. Some settings are only available in “Advanced Mode”. To see these settings, either click the “Advanced Mode” button or configure the system to always display these settings by checking the box “Show advanced fields by default” in System ‣ Advanced. When selecting the “Jail Root”, ensure that the size of the selected volume or dataset is sufficient to hold the number of jails to be installed as well as any software, log files, and data to be stored within each jail. At a bare minimum, budget at least 2GB per jail and do not select a dataset that is less than 2GB in size. if you plan to add storage to a jail, be aware that the path size is limited to 88 characters. Make sure that the length of your volume name plus the dataset name plus the jail name does not exceed this limit. If the network contains a DHCP server, it is recommended to check the box “IPv4 DHCP” (or “IPv6 Autoconfigure, for a properly configured IPv6 network). This will prevent IP address conflicts on the network as the DHCP server will automatically assign the jail the next available lease and record the lease as in use. If a static IP address is needed so that users always know the IP address of the jail, input the start and end address for the IPv4 and/or IPv6 network. The range that you define by the start and end addresses will be automatically assigned as you create jails. For example, if you plan to create 5 jails on the 192.168.1.0 network, you could input a “IPv4 Network Start Address” of 192.168.1.100 and a “IPv4 Network End Address” of 192.168.1.104. If you create a start and end range on a network that contains a DHCP server, it is very important that you also reserve those addresses on the DHCP server. Otherwise, the DHCP server will not be aware that those addresses are being used by jails and there will be IP address conflicts and weird networking errors on the network. When troubleshooting jails that do not install or which are unavailable, double-check that the IP address being used by the jail is not also being used by another jail or system in the network. FreeNAS® will automatically detect and display the “IPv4 Network” that the administrative interface is connected to. 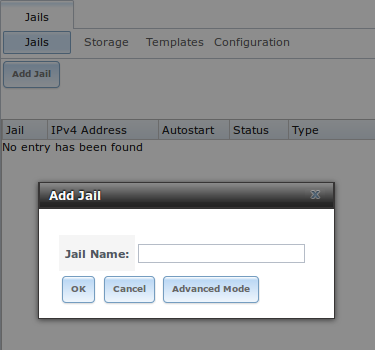 This setting is important as the IPv4 as the IP address(es) used by your jails must be ping able from the FreeNAS® system in order for your jails and any installed software to be accessible. If your network topology requires you to change the default value, you will also need to configure a default gateway, and possibly a static route, to the specified network. If you change this value, ensure that the subnet mask value is correct as an incorrect mask can make the IP network unreachable. When in doubt, keep the default setting for “IPv4 Network”. If you are using VMware, make sure that the vswitch is set to “promiscuous mode”. Once you click the “Save” button to save the configuration, you are now ready to create and manage jails as described in the rest of this chapter. To create a jail, click Jails ‣ Add Jail to access the screen shown in Figure 13.2a. the “Add Jail” menu item will not appear until after you configure Jails ‣ Configuration. By default, the only required value to create a jail is to give it a name. The default is to create a FreeBSD jail. Table 13.2a summarizes the available options. Most settings are only available in “Advanced Mode” and are not needed if the intent is to create a FreeBSD jail. 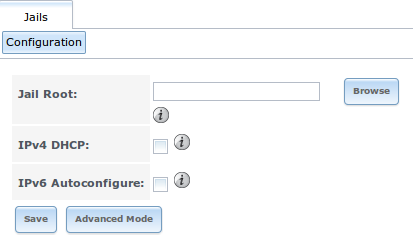 To see these settings, either click the “Advanced Mode” button or configure the system to always display these settings by checking the box “Show advanced fields by default” in System ‣ Advanced. the IPv4 and IPv6 bridge interface is used to bridge the epair(4) device, which is automatically created for each started jail, to a physical network device. The default network device is the one that is configured with a default gateway. So, if em0 is the FreeBSD name of the physical interface and three jails are running, the following virtual interfaces will be automatically created: bridge0, epair0a, epair1a, and epair2a. The physical interface em0 will be added to the bridge, as well as each epair device. The other half of the epair will be placed inside the jail and will be assigned the IP address specified for that jail. The bridge interface will be assigned an alias of the default gateway for that jail, if configured, or the bridge IP, if configured; either is correct. The only time you need to specify an address and mask for the bridge is when you need to configure the jail to be on a different network than the FreeNAS® system. For example, if the FreeNAS® system is on the 10.0.0.0/24 network and the jail needs to be configured for the 192.168.0.0/24 network, set the “IPv4 bridge address” and “IPv4 bridge netmask” fields for the jail. If you uncheck both the “VIMAGE” and “NAT” boxes, the jail must be configured with an IP address within the same network as the interface it is bound to, and that address will be assigned as an alias on that interface. To use a “VIMAGE” jail on the same subnet, uncheck “NAT” and configure an IP address within the same network. In both of these cases, you only configure an IP address and do not configure a bridge or a gateway address. After making your selections, click the “OK” button. The jail will be created and will be added to the “Jails” tab as well as in the tree menu under “Jails”. By default, the jail will automatically start, unless you specify otherwise by unchecking the “Autostart” box. The first time you add a jail or use a template, the GUI will automatically download the necessary components from the Internet. If it is unable to connect to the Internet, the jail creation will fail. Otherwise, a progress bar will indicate the status of the download and provide an estimated time for the process to complete. Once the first jail is created, or a template used, subsequent jails will be added instantaneously as the downloaded base for creating the jail is saved to the “Jail Root”. To view and configure the added jails, click “Jails”. 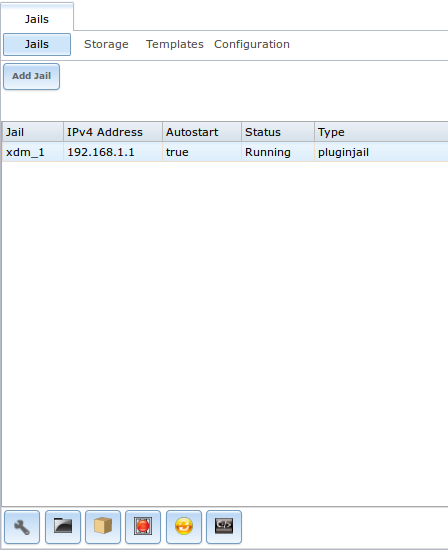 In the example shown in Figure 13.2b, the list entry for the jail named xdm_1 has been clicked in order to enable that jail’s configuration options. The entry indicates the name of the jail, its IP address, whether or not it will start automatically at system boot, whether or not it is currently running, and the type of jail (e.g. standard indicates that it is a FreeBSD jail whereas pluginjail would indicate that it was installed using Plugins). Edit Jail: used to edit the jail’s settings which were described in Table 13.2a. Note that once a jail is created, the jail’s name and type cannot be changed so these fields will be greyed out. if you need to modify the IP address information for a jail, use it’s “Edit Jail” button instead of the associated networking commands from the command line of the jail. Add Storage: used to configure the jail to access an area of storage as described in Add Storage. Upload Plugin: used to manually upload a plugin previously downloaded from the plugins repository. Start/Stop: this icon will vary, depending upon the current “Status” of the jail. If the jail is currently stopped, the icon will be green and can be used to start the jail. If the jail is currently running, the icon will be red and can be used to stop the jail. A stopped jail and its applications are inaccessible until it is restarted. Restart: used to restart the jail. Shell: used to access a root command prompt in order to configure the selected jail from the command line. When finished, type exit to close the shell. If you prefer to use ssh to access a jail instead of the jail’s “Shell” icon, you will need to first start the ssh service and create a user account for ssh access. To do this, click the “Shell” icon for the jail you wish to configure ssh access to. The jail’s RSA key pair should be generated and the key’s fingerprint and random art image displayed. Once the user is created, set the root password so that the new user will be able to use the su command to gain superuser privilege. To set the password, type passwd then input and confirm the desired password. each jail has its own user accounts and service configuration. This means that you will need to repeat these steps for each jail that requires SSH access. It is possible to give a FreeBSD jail access to an area of storage on the FreeNAS® system. This is useful if you install an application that stores a large amount of data or if an installed application needs access to the data stored on the FreeNAS® system. An example would be transmission, which stores torrents. The storage is added using the mount_nullfs(8) mechanism which links data that resides outside of the jail as a storage area within the jail. To add storage, click the “Add Storage” button for a highlighted jail’s entry to open the screen shown in Figure 13.2c. This screen can also be accessed by expanding the jail’s name in the tree view and clicking Storage ‣ Add Storage. Source: is the directory or dataset on the FreeNAS® system you would like to gain access to from the jail. This directory must reside outside of the volume or dataset being used by the jail. This is why it is recommended to create a separate dataset to store jails, so that the dataset holding the jails will always be separate from any datasets used for storage on the FreeNAS® system. Destination: select an existing, empty directory within the jail to link to the “Source” storage area. If that directory does not exist yet, type in the desired directory name and check the “Create directory” box. 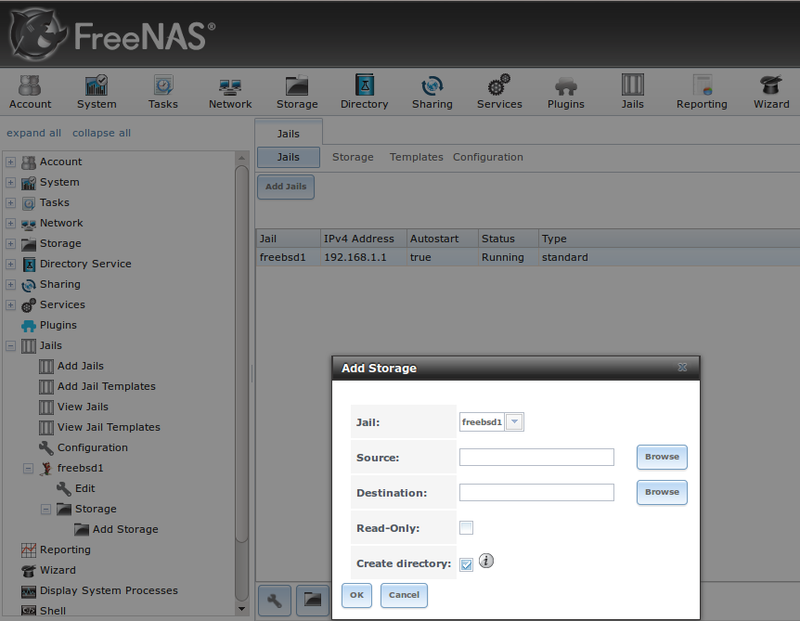 When you are adding storage, it is typically because the user and group account associated with an application installed inside of a jail needs to access data stored on the FreeNAS® system. Before selecting the “Source”, it is important to first ensure that the permissions of the selected directory or dataset grant permission to the user/group account inside of the jail. This is typically not the default, as the users and groups created inside of a jail are totally separate from the users and groups of the FreeNAS® system. Determine the name of the user and group account used by the application. For example, the installation of the transmission application automatically creates a user account named transmission and a group account named transmission. When in doubt, check the files /etc/passwd (to find the user account) and /etc/group (to find the group account) inside of the jail. Typically, the user and group names are similar to the application name. Also, the UID and GID are usually the same as the port number used by the service. On the FreeNAS® system, create a user account and group account to match the name of the user and group used by the application in the jail. 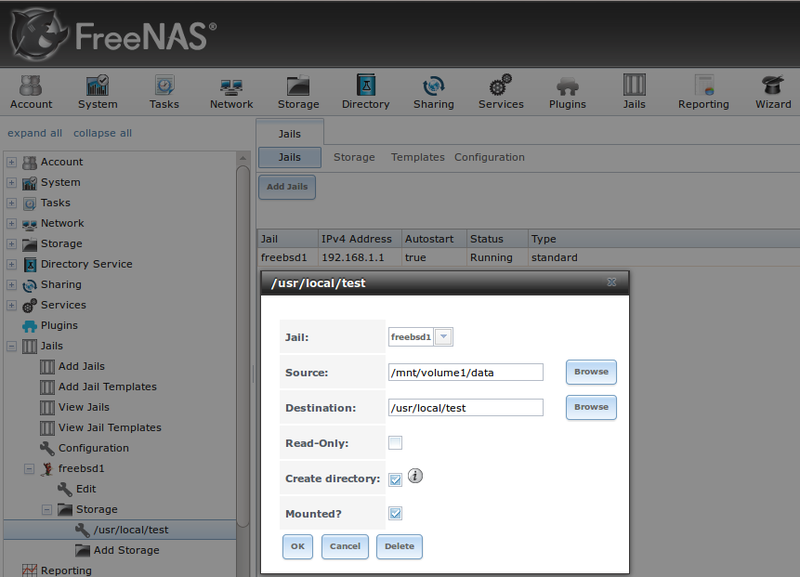 On the FreeNAS® system, determine if you want the jail to have access to existing data or if you want to set aside an area of storage for the jail to use. If the jail should access existing data, edit the permissions of the volume or dataset so that the user and group account has the desired read and write access. If multiple applications or jails are to have access to the same data, you will need to create a separate group and add each needed user account to that group. If you are instead setting aside an area of storage for that jail (or individual application), create a dataset. Then, edit the permissions of that dataset so that the user and group account has the desired read and write access. Use the “Add Storage” button of the jail and select the configured volume/dataset as the “Source”. If you wish to prevent writes to the storage, check the box “Read-Only”. By default, the “Create directory” box is checked. This means that the directory will automatically be created for you under the specified “Destination” path if the directory does not already exist. Once a storage has been added, it will be added to the tree under the specified jail. In the example shown in Figure 13.2d, a dataset named volume1/data has been chosen as the “Source” as it contains the files stored on the FreeNAS® system. When the storage was created, the user browsed to volume1/jails/freebsd1/usr/local in the “Destination” field, then typed in test as the directory. Since this directory did not already exist, it was created as the “Create directory” box was left as checked. The resulting storage was added to the freenas1 entry in the tree as /usr/local/test. The user has clicked this /usr/local/test entry in order to access its “Edit” screen. By default, the storage is mounted as it is created. To unmount the storage, uncheck its “Mounted?” box. a mounted dataset will not automatically mount any of its child datasets. While the child datasets may appear browsable inside the jail, any changes will not be visible. Since each dataset is considered to be its own filesystem, each child dataset must have its own mount point, meaning that you need to create a separate storage for any child datasets which need to be mounted. To delete the storage, click its “Delete” button. it is important to realize that an added storage is really just a pointer to the selected storage directory on the FreeNAS® system. It does not create a copy of that data within the jail. This means that if you delete any files from the “Destination” directory located in the jail, you are really deleting those files from the “Source” directory located on the FreeNAS® system. However, if you delete the storage, you are only deleting the pointer, not the data itself. The quickest and easiest way to install software inside the jail is to install a FreeBSD package. A FreeBSD package is pre-compiled, meaning that it contains all the binaries and dependencies required for the software to run on a FreeBSD system. A lot of software has been ported to FreeBSD (currently over 24,000 applications) and most of that software is available as a package. 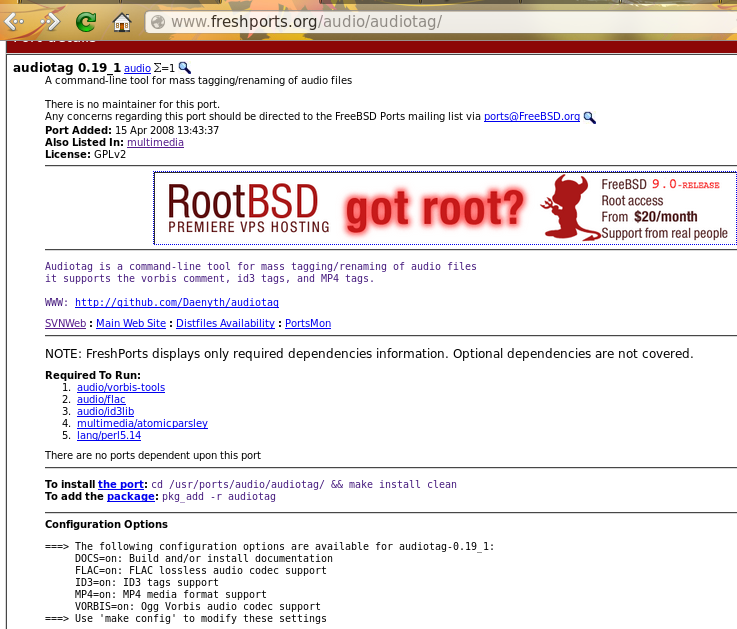 One way to find FreeBSD software is to use the searchbar at FreshPorts.org. do not use the pkg_add command in a FreeNAS® jail as it will cause inconsistencies in your package management database. Sometimes the package is out-of-date and you need a feature that became available in the newer version. Some ports provide compile options that are not available in the pre-compiled package. These options are used to add additional features or to strip out the features you do not need. It takes time. Depending upon the size of the application, the amount of dependencies, the amount of CPU and RAM on the system, and the current load on the FreeNAS® system, the amount of time can range from a few minutes to a few hours or even to a few days. if the port doesn’t provide any compile options, you are better off saving your time and the FreeNAS® system’s resources by using the pkg install command instead. You can determine if the port has any configurable compile options by clicking its FreshPorts listing. 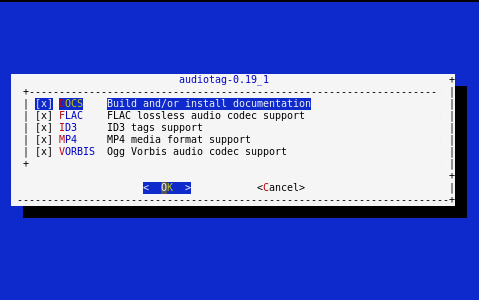 Figure 13.2e shows the “Configuration Options” for audiotag. In FreeBSD, a Makefile is used to provide the compiling instructions to the make command. The Makefile is in ascii text, fairly easy to understand, and documented in bsd.port.mk. If the port has any configurable compile options, they will be listed at FreshPorts in the port’s “Configuration Options”. This port contains five configurable options (DOCS, FLAC, ID3, MP4, and VORBIS) and each option is enabled (on) by default. FreeBSD packages are always built using the default options. When you compile the port yourself, those options will be presented to you in a menu, allowing you to change their default settings. if you install additional software at a later date, you should make sure that the ports collection is up-to-date using by typing portsnap fetch update. To change an option’s setting, use the arrow keys to highlight the option, then press the spacebar to toggle the selection. Once you are finished, tab over to OK and press Enter. The port will begin to compile and install. if you change your mind, the configuration screen will not be displayed again should you stop and restart the build. Type make config && make install clean if you need to change your selected options. If the port has any dependencies with options, their configuration screens will be displayed and the compile will pause until it receives your input. It is a good idea to keep an eye on the compile until it finishes and you are returned to the command prompt. Once the port is installed, it is registered in the same package database that manages packages. This means that you can use pkg info to determine what was installed, as described in the previous section. Once the package or port is installed, you will need to configure and start it. If you are familiar with how to configure the software, look for its configuration file in /usr/local/etc or a subdirectory thereof. Many FreeBSD packages contain a sample configuration file to get you started. If you are unfamiliar with the software, you will need to spend some time at the software’s website to learn which configuration options are available and which configuration file(s) need to be edited. Run tail /var/log/messages to see if any error messages hint at the problem. Most startup failures are related to a mis-configuration: either a typo or a missing option in a configuration file. If the software you need requires a different operating system or you wish to use a non-FreeBSD operating system to manage software, use the VirtualBox template to create an instance of phpVirtualBox. In the “Add Jail” screen, click the “Advanced Mode” button. As seen in the example in Figure 13.3a, input a “Jail Name”, verify that the “IPv4 address” is valid and not in use by another host or jail, and select VirtualBox from the “Template” drop-down menu. Press the “OK” button to begin the installation. Once installed, input the IP address of the VirtualBox jail into a web browser and enter the username and password of admin into the login screen. Once authenticated, the screen shown in Figure 13.3b will appear in the web browser. Click the “New” button to create virtual machines. You can then install the desired operating systems and software into the created virtual machines. if the FreeNAS® system reboots, the installed virtual machines will not automatically restart. To configure auto-start, refer to this forum post. FreeNAS® supports the ability to add custom templates to the “Templates” drop-down menu described in Table 13.2a. 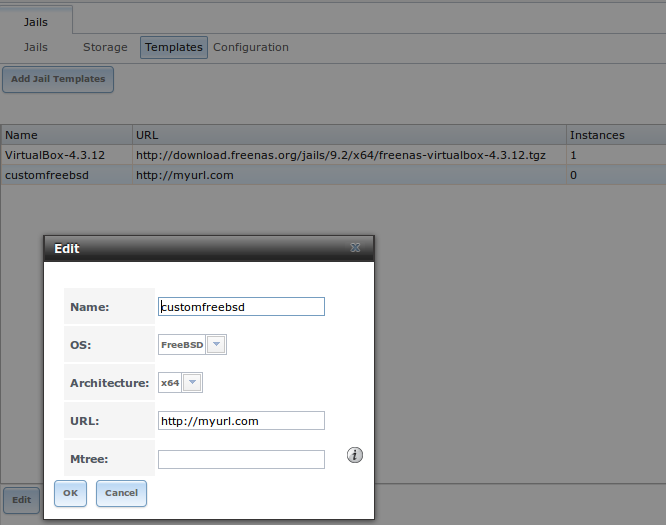 By default, FreeNAS® provides the VirtualBox template. To view the default and any customized templates, click Jails ‣ Templates. A listing showing the default template is seen in Figure 13.4a. Name: will appear in the “Template” drop-down menu when adding a new jail. 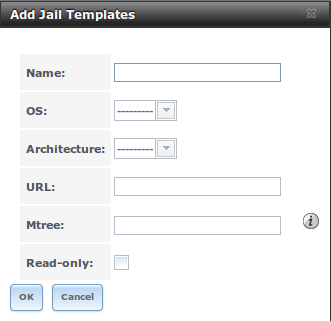 URL: when adding a new jail using this template, the template will be downloaded from this location. Instances: indicates if the template has been used to create a jail. In this example, the template has not yet been used so its “Instances” shows as 0. To create a custom template, first install the desired operating system and configure it the way you want. The installation can be either to an existing jail or on another system. Once your configuration is complete, create a tarball of the entire operating system that you wish to use as a template. This tarball needs to be compressed with gzip and end in a .tgz extension. Be careful when creating the tarball as you don’t want to end up in a recursive loop. In other words, the resulting tarball needs to be saved outside of the operating system being tarballed, such as to an external USB drive or network share. Alternately, you can create a temporary directory within the operating system and use the –exclude switch to tar to exclude this directory from the tarball. The exact tar command to use will vary, depending upon the operating system being used to create the tarball. Once you have generated the .mtree and .tgz files, save them to either an FTP share or an HTTP server. You will need the associated FTP or HTTP URL in order to add the template to the list of available templates. To add the template, click Jails ‣ Templates ‣ Add Jail Templates which will open the screen seen in Figure 13.4b. Table 13.4a summarizes the fields in this screen. Once a template has been added, you can click the entry for the template to access its “Edit” and “Delete” buttons. If you click a template’s “Edit” button, it will open the configuration screen shown in the Figure 13.4c. the “Delete” button is not available for the built-in VirtualBox template and its “Edit” button opens as read-only. If you click a template’s “Delete” button, a warning message will prompt you to confirm the deletion. Note that once a template is deleted, it will be removed from the “Templates” drop-down menu and will be no longer available for creating new jails.